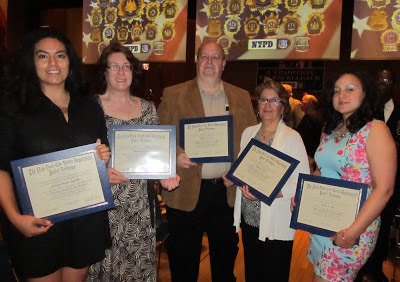 Five members of the Woodhaven Residents' Block Association graduated on Tuesday, June 18, from the NYPD's Citizens' Police Academy, an in-depth 14-week program that provides extensive training and education about the Police Department's work. The Block Association members who graduated—WRBA Treasurer Stephen Forte, Janet Forte, Marie Paz, Elaine Carillo, and Susan Sweeney—received their diplomas from NYPD Commissioner Ray Kelly in a ceremony at One Police Plaza. Stephen Forte, Janet Forte, and Marie Paz. e law, hostage negotiations, child abuse, counterterrorism, and school safety. The graduates even had the opportunity to use the NYPD's sophisticated firearms training simulator. "The Citizens' Police Academy taught me a remarkable amount about the Police Department's work. It deepened my appreciation for all that goes into policing, and it made me much more aware of how I can help the police in my community," said WRBA Treasurer Stephen Forte. "I look forward to applying those lessons in my civic involvement with the Block Association." The total number of WRBA members who have completed the program in the past year now stands at eight. "Equipped with this training, you're now among the best-informed members of the public on the challenges facing the Department," Commissioner Kelly said in his commencement address. "From this day forward, the Department is proud to consider all of you our allies in the community."